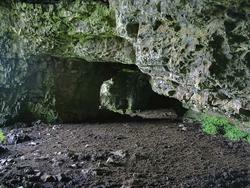 Image: Keshcorran caves from below. Photographer: Jon Sullivan. With kind permission. Location: Keshcorran, Sligo. 6km south of Ballymote on R295, south of Sligo. 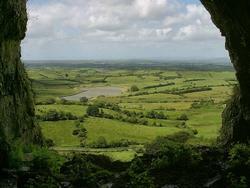 Image: View out of one of the caves. In the north western part of Ireland, a little south of the city Sligo is a small limestone karst area with several caves. The limestone cliffs of the King Mountains form a picturesque landscape with some (locally) famous mountains, like Ben Bulben (Beann Gulban). This massive hill faces the sea, ridged in shape like a ship's prow. Other hills are called Fairy hill (274m asl) near Cloonacool and Keshcorran (350m asl) near Ballymote. 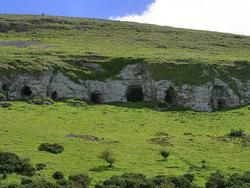 Keshcorran is the location of seventeen small caves. They are located at the foot of a steep limestone cliff and are reached by a 200m ascend on a steep grassy slope, which is used a sheep pasture. The caves are small, but the portals are high enough to stand upright. This part of Ireland is probably the part with the richest remains of the celtic ancestors. In the west of Ireland the old celtic language and numerous legends and fairy tailes survived. So it is evident that the well known caves of Ceis Churainn are the location of numerous legends. 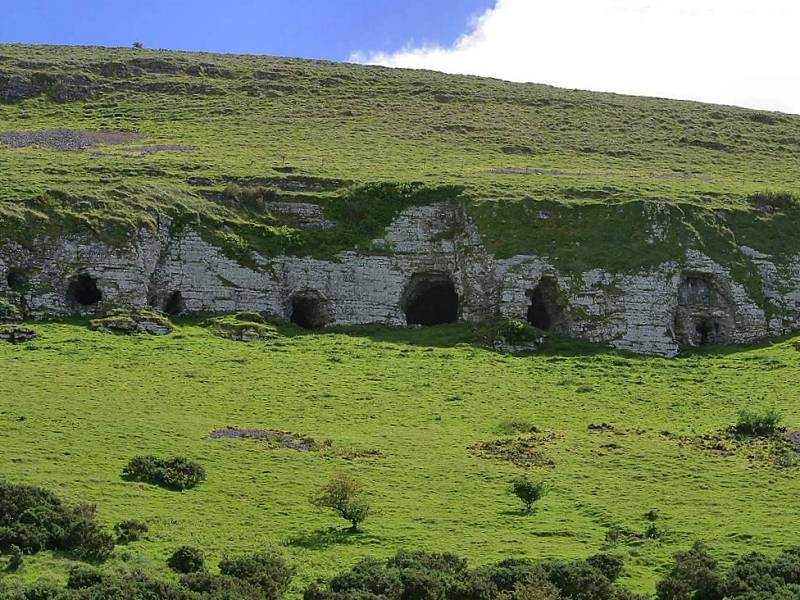 Cormac MacAirt, a famous King of Ireland, was reputedly born and raised by a she-wolf in these caves. A famous myth of the Ulster cycle called The Death of Diarmuid in the Boar Hunt took place here. Diarmuid and Gráinne are said to have taken refuge from the vengeful Fionn mac Cumhail in one of the seventeen caves on its west side. Fionn mac Cumhail was drawn into the caves by three Otherworld women who spun awry with spindles of holly. Fionn and Conan became enspelled on touching the spindles and lost their strength until they were rescued by flaming haired, one eyed Goll. Knocknarea, a fabled mountain on which Queen Maeve is said to be buried, offers a spectacular view of Sligo Bay and five counties. Just coincidence, that there exists a prehistoric passage tomb right above the caves on the top of the hill? Another type of legend, a legend of secret connections to far away locations, is told in the following text. "The cave is said to communicate with that in the county of Roscommon, twenty-four miles in distance, called the Hellmouth door of Ireland, of which it is told (and believed in both counties) that a woman in the county of Roscommon having an unruly calf could never get him home unless driving him by holding him by the tail; that one day he tried to escape and dragged the woman, against her will into the Hellmouth door; that unable to stop him, she ran after him without quitting her hold, and continued running until next morning. She came out at Kishcorren, to her own amazement and that of the neighbouring people." The caves were used by man since prehistoric times. They were the site of ritual gatherings at seasonal festivals such as Lugnasa until the last century. Search Google for "Caves of Keshcorran"